As you can tell from the name, slots reign supreme at Sloto’Cash Casino. Slots are by far this casino’s best feature. 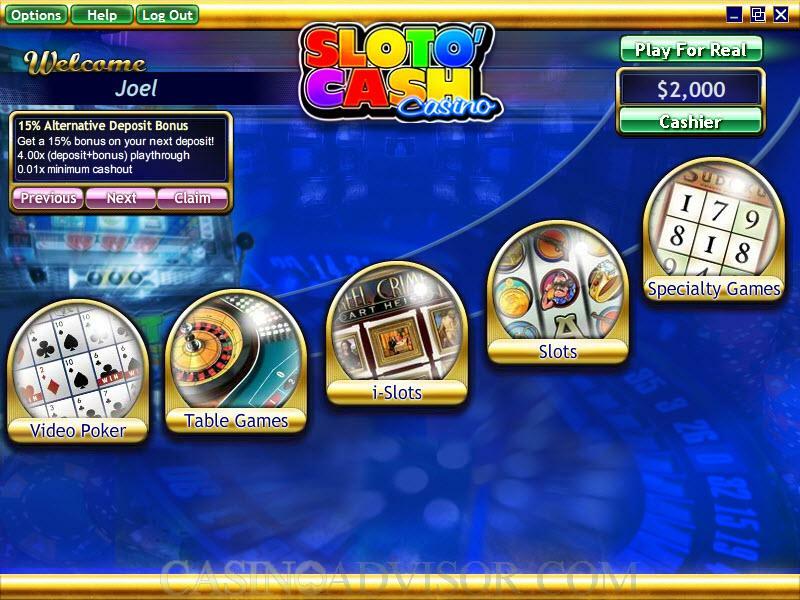 So if the other slot machines you have been playing haven’t delivered in a while, now might be the perfect time to see what Sloto’Cash can do for you! Sloto’Cash Casino is not a giant casino by online standards. You won’t find 400, 500, or 600 games, but ask yourself honestly if that is what you really want or need. With more than 170 games, most of them slots, you should find enough of a choice to keep you happily entertained no matter how often you return to play. If slots are your game of choice, it’s easy to find some to your liking at this casino since you can choose from classic 3-reel slots, thrilling 5-reel video slots, and progressive jackpot slots. The latter includes enticing titles like Aztec’s Millions, Cleopatra’s Gold, Shopping Spree II, and Megasaurus, all from the RTG progressive jackpot network where one spin can be life changing. Alternatively, if you are on the go a lot, you will definitely appreciate the anytime, anywhere convenience of using the Sloto’Cash Casino mobile app to play games on your smartphone or other mobile phone or tablet. The Sloto Cash apps are compatible with Apple iOS devices, going back to iPhone 4S and 5, iPad 2, 3rd and 4th Generation, and iPad Mini, along with all currently used Android tablets and phones, including smartphones. The newer generations will of course present the games in an even better light thanks to the improved screens and also the bigger size. Sloto’Cash Casino has a quality support team. Our experience shows that they are willing to work with players, highly responsive, and easy to contact. A Sloto’Cash support representative can be reached 24/7 by live chat on the website or within the casino lobby. The casino also has a dedicated email address for support inquiries. Sloto’Cash Casino’s selection of RTG games have been proven fair through independent audits. While the casino does not have links to full audit certificates, the support team is willing to provide more detailed information to players. The games are fun, RTG based casino which is fine by me. Most importantly for me are that withdrawals have been hassle free. I have won at other casino’s and still wait for my winnings; Slotocash had my withdrawl in my Bitcoin wallet in 48 hours. The magazine they send out is very nice, graphic design and printing are first class. Thank you for the great customer support you offer as well. I had a wonderful experience at this online casino. Started play on March 26 (3rd deposit), won over $2,000. Had to submit my forms and be verified first before a withdraw (I personally think this is a good idea). I was approved by April 5th, then I withdrew on April 6th. I got my money today April 19th by fed ex. There is only one other casino that was quicker then this one and I have tried more then several, but I felt the whole process and communication was wonderful. I have been playing online for over 10 years, and I feel over all this casino was very Fair overall. I will be playing here a lot. The games were fun and there was a variety. Customer service was great. I used a no deposit bonus and won about $500. They honored it without any major issues. I didn’t have to be one of their VIP members I only just started and deposited for the first time. They treated me very well. I have dealt with competitors who weren’t so nice. I am surprised that Slotocash has such a low rating. Withdraw time is decent, on average they paid within 3-4 days, which isn’t to bad for an RTG casino. They have a lot of bonuses to help extend playtime. Most importantly, it is possible to win at this casino. It is one of the best RTG casinos that I have had the experience to play at and I play at quite a few. However, I don’t play here as often now due to the fact that they no longer allow me to use their great bonuses. Presumably because I am up on them by a few dollars. In the end it is their loss, as the house always wins in the end. My experience at SlotoCash at the beginning was Great! I played with a Bonus and got a Small Cash out, ($300-$400). Verification was Very Quick and Smooth, No problems there. Check was delivered in just a Couple of Days. Everything went as it should in a Online Casino. I still like the Casino, but have cut back on my Deposits. As I’ve not had a Single win here, since my 1st Withdrawal. I don’t believe in Bad or Good “Luck” Streaks, that’s a Myth. A Slot is programmed to pay out a percentage. Support was Great with my one withdrawal, Couldn’t ask for any better. .. They do payout quicker than other Casinos in my experience, I just have only been able to do 1 small Cashout, after quite a few deposits. I signed up to SlotoCash and took their $31 no deposit bonus. I wagered X60 and are left with about $150. Wagering was a lot but I guess I was lucky. I requested a withdrawal and sent through my Documents for verification. I like this casino and I hope they won’t give me any withdrawal issues. Will post a further update as soon as my withdrawal is complete. For now I would recommend playing at this casino. If this is your choice, Slot Cash Casino is hit right in the middle because of their promotion are so numerous, so their addition would not have the heart to blame anything. The situation is even better when you take the fact that Slotocash is a member of the distinguished group RTG software, the size of the trust is measured by the hundreds of thousands, successful and accomplished payments to millions. 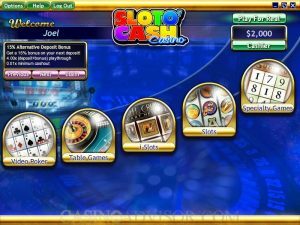 Slotocash casino is a guest in my home since the beginning of his existence, and that was sometime in mid-distant 2007. Eight years of experience in a casino is enough to present their experiences and share them with you. These 2007 years had a few deposits but none exceeded 50 €, the reason is obvious I have not disposed of so much money, how many today have. Another reason is that then the gambling industry was not even similar to the present, and then only form a trust towards online gambling in general. People in previous years, were skeptical and suspicious, their money are more carefully invested than today when we have black lists where there are only those which trust is not his strong suit. Last month I had a single payment of 90 €, and I lost all of two days at the Triple Toucan slot machine. Often I play a few freeroll tournament which is available in Slotocash tournament section. Payment options are standard, there you have three possibilities to deposit and withdraw: Neteller, Moneybookers and Ecocard, while other possibilities offer only deposit such as: MasterCard, Visa, American Express and WebMoney. Some methods can serve only to withdraw money from the account as follows: Bank Transfer, Paysafecard and Cheque. I am the biggest fan of adventure when it comes to new life experiences in general, and particularly in the area of Internet gambling. As a movie buff who has passed all possible readings of all genres, and I want to try everything that is currently offered in the market in relation to this form of entertainment. I love that sometimes I go into the unknown and release again my spirit of adventure games. Not everyone agrees that gambling is an adventure, but I’ll keep it because I’m that kind of adrenaline explosion attracted to the fact that the classic adventure attract me. Slotocash until recently was unavailable for my country (Bosnia and Herzegovina), but fortunately that has changed. I admit, Slotocash has a special place here, and because I shared my experience with this generous casino, especially when it comes to gains, as well as bonuses and other promotions. We should not see it as a blessing, or my favoring certain casinos, this is purely experience and complete impression of a man who is over 12 years in the world of online gambling, it does mean something. My deposits here ranged from 50 to 350 €, so far I have made them at least 5-6 times, I can say that in terms of finance Slotocash one of the most reliable casinos currently operating on the Internet. Their work is based on frequent promotions, mainly to deposit the players because I just do not find any promotion that does not deposit as a condition of obtaining. Numerous payment options have made, that this casino occupy such a high position in the world’s gambling industry, here you can use the following methods deposit and withdraw and they are: Neteller, Visa, Mastercard, Ecocard and Moneybookers. The last 15 days I did not check, perhaps they even threw in a new method, but this is enough for those who have properly distributed money to accounts and cards. Customer support as with other RTG casinos is just instant and it is a pleasure to interact with them. From me to Slotocash Casino only words of praise when it is otherwise, I’m such an experience also to share with people who share with me the same fate, the fate of the gambler.